Hasaacas Ladies have won the NC Women's Special Competition after beating Ampem Darkoa 3-2 in the final match played at the El Wak Stadium on Sunday. The Western region based side came from two goals down to stun Ampem Darkoa with Evelyn Badu, Milot Pokua and Perpetual Agyekum all on target. Ophelia Amponsah shot Ampem Darkoa into the lead before Mavis Owusu tapped in from close range after a goalkeeping blunder to increase the tally. Hasaacas Ladies pulled one back five minutes before recess courtesy Evelyn Badu. Ghana U17 forward then Milot Pokua drew her side level before the halftime break. After dominating play in the second half, Hasaacas Ladies were awarded a penalty in the 7th minute which was converted by competition top scorer Perpetual Agyekum. The "Do girls" held on to their lead till the game ended to emerge as champions of the special competition. 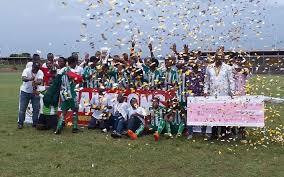 Hasaacas received the GHC50,000 prize money as winners with Ampem Darkoa also receiving GHc30,000.